Have been reading a few stories here and want to share mine as well. I think everyone will always have a questions and thoughts about this injury. The more you read the more you confuse? Everyone want to have the best knee back..so what really matter ? I'm in the confusion which one is the best pattela or hamstring? (double bundle 4 strands, semintendinosus and gracilis)>long term and overall..what would be the best? I been playing basketball for 20 plus years and still love to play until I can not carry that orange ball. I'm only 33 years old and its quite early to stop playing. I injured my knee while playing basketball last 11 Sep 201. I'm running at full speed and about to jump using my right knee, when I'm already trying to jump at my right knee full weighta nd full speed, got twisted and there I go. I roll on the floor hearing the pop and at that moment realize its a serious injury. I didnt manage to walk , was sent to the hospital. Xray negative and 3 weeks after MRI results complete tear ACL and partial tear meniscus. Then I got confuse which one is the best, patella vs hamstring. 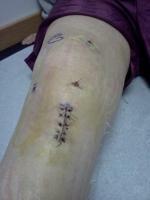 My surgery completed last 15 Oct 2010. It was only 1.5 hrs then was sent to the recovery room. When the anesthesia went away in my body , i started to feel the pain. I know everyone know's how painful. The wound looks good after day 1 it was cleaned. ( So neatly done). Day 2 was fine I can walk with crutches but the brace too heavey and heating my tibia. It was so painful. Day3 nothing much but I can say its really improving. Day4 have to see the physio ... I manage to perform all the task except for the leg raise. I find my leg heavy and and the wound a bit hurting. Now its my 8th day. I can flex until 60 deg only. I still strugle to carry my leg. The front leg raise. Until here only...my story will continue then. going back to my point.. everyone wants to have the best results and the best knee again...I think there are a lot of factors that contibute to this. 1.graft, 2. Surgeon and the surgery 3. Rehab. 4. Lifestyle so its a matter of being positive about this. All the best everyone! excited to read some stroies too!